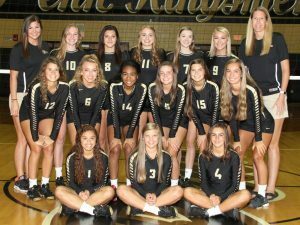 Penn outlasted Marian last night in a match-up of Northern Indiana Conference Volleyball powerhouses. Penn took an early lead as the Kingsmen won the first two sets 25-22, and 25-23. Marian stormed back to win the third set 25-22. Penn closed out strong to win the final set 25-22 and earn the victory. Penn, ranked No. 6 in the state, moves to 13-1-0. Italia Fields led the Kingsmen with 14 kills. Alyssa Torres and Kylee Hixenbaugh both had 13 kills, and Rachel Rupert had 11 kills. Naomi Willis helped out with 46 assists. Rachel Hickey had 40 digs. followed by Ally Hickey and Julia Beers with 17 digs each. Naomi Willis and Kylee Hickenbaugh chipped in with 14 and 12 digs. Penn Volleyball’s next match is home on Thursday, Sept. 7, at 7 p.m. against Jimtown.